I’m guest posting over at Read a Romance Month’s blog today, sharing some thoughts on food and romance, plus trying out a recipe from Brenda Novak’s new cookbook to raise funds for the American Diabetes Association. 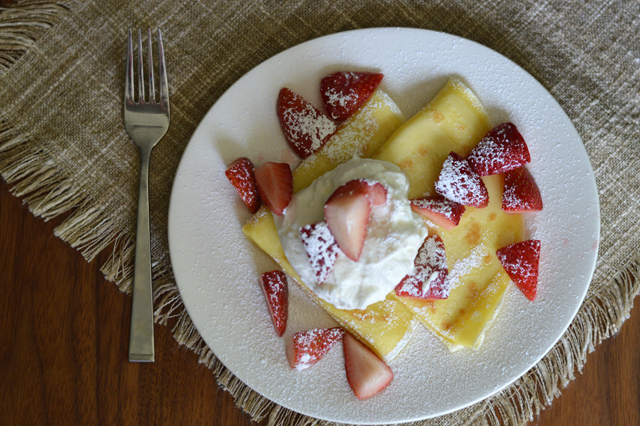 I made the crepes from the book and they turned out great. I also got a sneak peek at the rest of the cookbook and all the recipes look really good. Plus, it’s for a good cause and there’s a giveaway of a couple of my favorite foodie romances, including Sweet Disorder by Rose Lerner and Alexis Hall’s latest, For Real. And just to entice you to go read the post, I’m including a bonus recipe here. Brenda suggested filling the crepes with fruit or goat cheese and blackberry jam. But I happened to have some whipping cream left over from another recipe so I decided to see if I could make goat cheese whipped cream. Doesn’t that sound good? Turns out…it is good. Really good. Good enough that I pretty much think that breakfast should always include honeyed goat cheese whipped cream. And fresh farmer’s market strawberries. 1. In a medium bowl, combine goat cheese, powdered sugar, honey and 1/4 cup of the whipping cream. Using a hand mixer, mix on low speed until smooth. Add the remaining whipping cream and beat on medium speed until fluffy, about 3-5 minutes. 2. 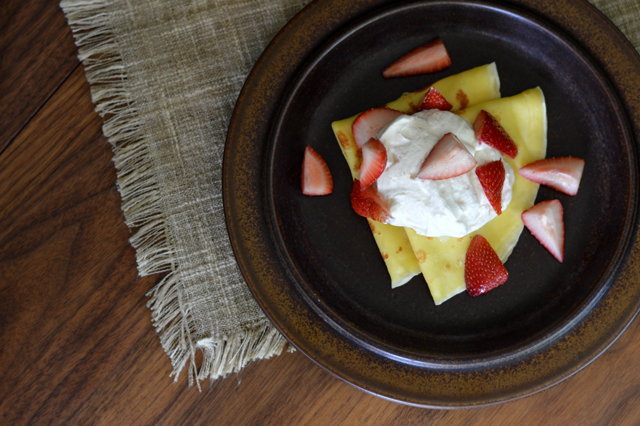 Serve with crepes or french toast for breakfast or with crepes and fresh berries for a light spring dessert.